Californians may get a break from their cell phone companies – a big one. Late last month Judge Bonnie Sabraw, a Superior Court Judge in Alameda County, ruled that cell phone carriers that charged customers early termination fees for canceling their contracts did so in violation of state law. In a class action lawsuit against Sprint Nextel that challenged the charging of early termination fees on contracts, the judge rules that the practice was against the law and ordered the company to pay over $18 million to Sprint customers in California. Of course, Sprint plans to appeal the ruling but if it stands, it could be the beginning of a nationwide consumer revolt. There are other such lawsuits across the country that challenge the fees and this ruling, while only a preliminary one, invites more of the same. Cell companies do not like this at all. In fact, they are heavily lobbying the Federal Communications Commission to regulate the fee and protect cell phone carriers from future lawsuits. FCC Chairman Kevin Martin has already publicly proposed an initiative to prorate the fees during the period of the service contract. Sprint Nextel claims the charges are reasonable and necessary to offset the cost of the cell phones offered in contract, which they maintain are sold to users below cost. However, the popular opinion among cell phone users and apparently, that of the judge herself, is that the fees are in place to discourage users from dropping the service and switching to another carrier. I despise cell phone service contracts and I think they are very bad for consumers. If you are stuck with a carrier that doesn’t deliver services to your satisfaction, you are stuck. I wouldn’t mind paying more for a cell phone if it would mean I am a free agent and can fire the company and hire another one to serve me anytime I want without penalty. This is also why I don’t own an iPhone. When I purchase a cell phone – or any tangible product – I want the freedom to choose when and how it will used. I don’t like to be told to pay a premium for a mobile device and told who my carrier will be. I don’t appreciate being locked into a contract at overpriced rates just to have a pretty phone. If I like the phone but I don’t like the service, I want to be able to switch to a service that I feel serves my needs. If I can’t, the phone isn’t worth the money that created it. If the sole reason for early cancellation fees is to offset the cost of the phone, there’s a simple solution: sell the phone for what it’s worth and ditch the fees. So, what If you BYOP (Bring Your Own Phone) and order service? Are you offered open monthly service or a contract without cancellation fees? Apparently not, or at least not that I could locate when I searched the Sprint Nextel web site. I did find one thing. Included in their Terms and Conditions, which is located behind links buried within the individual service plans listed on their site, is a clause stating that by signing the agreement, Sprint Nextel customers waive the right to pursue or join a class action lawsuit. I am all for competition by creating new and innovative ways to perform common and standard tasks. Given the current state of the search industry with few serious contenders, the prospect of one major player partnering with the other one in specific areas and the possibility of that search engine’s sale to another, the announcement of a new guy on the block is a big deal. So, when news broke of the launch of a new search engine called Cuil with the potential to stand with the likes of Google and Yahoo I was there, ready to give it a go. Of course, I was a little skeptical at the news but put my preconceived notions aside to give it a fair shake. For all I knew it could be everything it was hyped to be and more. The only way to find out was to try it for myself, which I did. After playing around with this new search tool my first impression is rather mixed. I can’t say that I am disappointed but I can understand why a lot of others are. Disappointed is a strong word for me in this case; it denotes an attitude of final judgement that I do not want to convey. I prefer to say that it has potential. I think it does, although it will take time and tweaking to get there. It looks different, no doubt about that. Like many others who have opined on the net, I was a little put off and disoriented by the layout of the search results. We are all generally accustomed to lists of links and content clips that are easy to scan and scroll from top to bottom, with those deemed by the search engine as most relevant listed on top. The results of a typical search on Cuil are spread across the page in a combination of titles, descriptions and pictures that at first glance (and for me continuously, if I stare at the page for awhile trying to sort out the sort order) appears to have little or no hierarchy in terms of search relevance. I suppose one could get used to it over time and in an odd way it does seem more aesthetic, however if there is a logical order or relevance to the search results I just didn’t see it on the searches I did. In fact, I looked at eighteen pages of one set of search results that had over a million hits and found that many of them were nearly complete duplicates of previous pages, which was very confusing and more than a little annoying. The redundant listings of entire pages was a time waster for me, especially given the fact that each page was somewhat slow to load. I ended the search with the notion that if it wasn’t on the first two or three pages, it wasn’t worth checking further. Of course, the very first search I tried was The Force Field. Type The Force Field in Google and the web site www.theforcefield.net is usually at the top of the search results. Type it in Yahoo and you get the same. Search it in Dogpile and it is in the top four. Cuil ? Not even directly listed. Now, it’s only been around for a couple of days and it takes time for search bots to scour billions of pages on the web, so I didn’t exactly expect Cuil to list it in the top ten. But the hype was that Cuil was already the largest repository of indexed pages on the net, claiming to be much larger than Google. So I expected at least one page from The Force Field dot Net to be listed in the search results. I searched through numerous pages in the returns and it wasn’t there. Yet several other sites that were generally lower on a Google or Yahoo search were listed right there on the first page of listings in a Cuil search. Now, there were listings for other sites that referenced or linked to The Force Field and The Force Field podcast, quite a few, in fact. There was just no direct listing for the home page of the site itself. Okay, they didn’t list The Force Field. Hey, it’s not as if we’re a big company like Microsoft , is it? Well, it might as well be, because during another search session I typed in Microsoft. Guess what? There were numerous third party references to Microsoft and Microsoft products but a link to their home page, which I would expect to show at the top of the first page, wasn’t the first item displayed, as I would have expected. The links to the website were there but some of the titles didn’t seem to match the search query. Mixed in were seemingly irrelevant entries to other sites with no apparent relation to Microsoft. I mean, this is Microsoft, one of the most universal household names and one of the most high profile web sites in the world. Just another listing on a targeted search? Now, that just isn’t natural. But that was only a minor bug for me. The real annoyance was not the listings themselves but the other items attached to them – the pictures. For every search I did, the results returned included site links accompanied by pictures that were completely unrelated to the sites. For instance, I did a search for The Force Field in search of a link to www.theforcefield.net and the same pictures kept cycling through on the listings. None of them were related to The Force Field podcast or the web portal. Few of them were actually related to the sites they linked to. I then ran a search for The Force Field podcast. This time there were a few hits for the show, but again, the same unrelated pictures, none of which were actually connected to the show, the site or the sites that referenced or linked them. This was just plain weird. The concept of a more graphical search is nice, however it is somewhat confusing and a bit annoying when the pictures don’t actually represent the page listed or anything remotely connected to it. Now, my initial foray into Cuil was not at all scientific nor was it organized. I was just another user searching the web. But then, isn’t that a real world scenario for using a search engine? If searches like mine are normal, what can we normally expect based on the results I experienced? I know I sound too critical and it isn’t my intention. I am just reporting my first impressions of Cuil. Overall I like the concept and the layout of the site is something that, while unconventional for me, is something I could probably become accustomed to and possibly prefer over traditional formats in time. However, I do think it needs some work and a lot more tweaking to get it to the point where it becomes a serious contender for the search market. It’s a great concept, I just don’t think it’s there yet. Before we pass judgement on it, we need to give it some time. This is an ambitious project and I wish it success. Have you tried Cuil? Have you had a similar experience with it or do you get completely different (good or bad) results? What do you think? Kevin Wessell, a nationally renowned business executive and highly respected expert in the field of business planning and corporate credit building and CEO of 1-800-Company.com, offers expert advice to those who wish to start a business: form a corporation or LLC and build business credit. Wessell explains how businesspeople can do this without affecting personal credit and regardless of personal credit history. Los Angeles (PRWEB) July 29, 2008 — To succeed in the business world, Kevin Wessell, CEO of 1-800-Company.com, recommends individuals form a corporation or limited liability company (LLC) and build business credit, rather than risking personal credit. Wessell, a nationally renowned business expert, provides tips and insight for those interested in forming a business, helping them start on the correct path. When starting a business, many people consider taking out a personal loan, maxing out their credit cards, borrowing from a family member, using their life savings, or even taking on a partner. "But think twice before doing so," Wessell says. "With these options you risk going into debt, harming your personal credit history and even falling prey to lawsuits." According to Wessell, the first step to success is forming a corporation or LLC. Wessell recommends forming a Nevada Corporation or LLC for the maximum personal asset protection and lowest tax base. "If they form a corporation or form a LLC and build business credit, they can get cash to cover start-up business expenses or grow their business. They can secure cash lines of credit to operate their business and cover automobile and equipment leases without a personal guarantee or personal credit check. They may also be able to obtain lines ranging from $50,000 up to $5 million," Wessell says. "Unsecured lines of credit can be obtained, though naturally, they are the most challenging." The next item to think about is how long it takes to build credit for a business. "If someone starts building corporate credit from scratch it may take four or five years, whereas if they use a professional business credit building service or purchase an aged company or shelf corporation – an existing company that was formed months or years ago – it can take as little as 30 to 90 days," Wessell says. Some people say business credit cannot be built separately from personal credit and that there is no way to speed up the credit building history. Wessell strongly disagrees. "We have an enormous list of satisfied clients. We've been helping people form their own corporations and accelerate the building of their business credit for over 30 years. We have clients who have built successful multi-million dollar companies after incorporating with 1-800-Company.com and our affiliated companies." In order to reduce the amount of time they have to wait to obtain business credit, many new business owners take advantage of these accelerated credit building programs and corporations that are already created with pre-established credit histories. "In this modern-day economy, there simply isn't the luxury afforded to slowly build up a company. The competition is looking for fast funding in order to build and take over the marketplace," Wessell says. "One of the most important items a company needs in order to achieve success and rapid growth is a capital infusion, and this is where business credit is often critical to the success or failure of a company." Established in 1977, 1-800-Company serves businesses and individuals with incorporating services, establishing LLCs (Limited Liability Companies), creating offshore companies, offshore banking services, tax reduction strategies, asset protection and privacy programs. London (PRWEB) July 29, 2008 — Canonical Inc. announced today a major new release of Launchpad, including features that make collaborative development faster and more flexible and allowing users to integrate their standalone project infrastructure with Launchpad. Launchpad is a hosting platform for free software that helps bring communities together. It is distinguished from other project hosting facilities in that it strives to make it as simple to collaborate within a project as it is to collaborate with other projects. For example, distributions can coordinate their bug work efficiently with upstream projects, and with Launchpad 2.0 this is true whether the project uses Launchpad or its own standalone bug tracker. There are now more than 7,000 projects in Launchpad, and vibrant communities have sprung up around translation, quality assurance, development collaboration and user support. Launchpad's a great way to promote a project, and developers who register their projects on Launchpad are often surprised by the attention their software receives from interested contributors. This 2.0 release includes a beta version of an Internet services API that allows external applications to authenticate, query and modify data stored in Launchpad's database programatically, bypassing the web interface. Launchpad 2.0 also includes an updated version of the Bazaar (bzr) distributed version control system which significantly improves the experience of developers hosting larger codebases. "Launchpad was conceived as a nexus of collaboration for Open Source projects to make them more efficient to build, easier to collaborate on and more open to innovation from community participation," said Mark Shuttleworth, CEO, Canonical. "Launchpad 2.0 marks the culmination of months of work and a series of incremental releases that have smoothed the workflows for all projects using the service. A comprehensive set of API's, and the ability to reach out to other excellent development tools like Bugzilla and Trac, now make Launchpad even more useful to the entire community, blurring the line between projects that use Launchpad directly and projects that can now exchange information productively while still maintaining control of their own infrastructure." Code reviews: the Bazaar version control system makes it incredibly easy for anyone to create their own branches for development of new features and bug fixes on your code. Now Launchpad makes it easy for you to manage the integration of their changes back into your project. The system keeps track of branches that have been proposed for merging into your mainline, and automatically creates a mini-mailing list for the discussion of landing. It also keeps track of approvals by key developers on whether it's ready for your project. With a web interface to reviews, anyone can get involved. Mailing lists: Mailing lists are the heart of free software discussion and consensus building. Each team in Launchpad can have a hassle-free mailing list of its own, with everything you'd expect: subscriptions determined by team membership, automatic archiving and virtually no need for list administration. Integration with Bugzilla and Trac: Launchpad helps different communities work together to find a fix for their common bugs by sharing their bug comment history. Now you can conduct a cross-project conversation even with projects that use Bugzilla or Trac, thanks to our new, GPL-licensed plugins. Simpler, more intuitive web interface: easier navigation to allow users to more easily find what they need in the vast Launchpad environment. Canonical, a global organisation headquartered in Europe, is committed to the development, distribution, and promotion of free software products, and to providing tools and support to the free software community. Canonical is the developer of Launchpad and lead sponsor company for Ubuntu, which since its launch in October 2004 has become one of the most highly regarded Linux distributions. Ubuntu, Kubuntu, Edubuntu and their associated logos are all registered trademarks of Canonical Ltd.
PALO ALTO, Calif. & SANTA CLARA, Calif. & SUNNYVALE, Calif. (Business Wire EON/PRWEB ) July 29, 2008 — HP (NYSE:HPQ), Intel Corporation and Yahoo! Inc. (Nasdaq:YHOO) today announced the creation of a global, multi-data center, open source test bed for the advancement of cloud computing research and education. The goal of the initiative is to promote open collaboration among industry, academia and governments by removing the financial and logistical barriers to research in data-intensive, Internet-scale computing. The HP, Intel and Yahoo! Cloud Computing Test Bed will provide a globally distributed, Internet-scale testing environment designed to encourage research on the software, data center management and hardware issues associated with cloud computing at a larger scale than ever before. The initiative will also support research of cloud applications and services. HP, Intel and Yahoo! have partnered with the Infocomm Development Authority of Singapore (IDA), the University of Illinois at Urbana-Champaign, and the Karlsruhe Institute of Technology (KIT) in Germany to form the research initiative. The partnership with Illinois also includes the National Science Foundation. The test bed will initially consist of six “centers of excellence” at IDA facilities, the University of Illinois at Urbana-Champaign, the Steinbuch Centre for Computing of the Karlsruhe Institute of Technology, HP Labs, Intel Research and Yahoo!. Each location will host a cloud computing infrastructure, largely based on HP hardware and Intel processors, and will have 1,000 to 4,000 processor cores capable of supporting the data-intensive research associated with cloud computing. The test bed locations are expected to be fully operational and made accessible to researchers worldwide through a selection process later this year. The test bed will leverage Yahoo!’s technical leadership in open source projects by running Apache Hadoop — an open source, distributed computing project of the Apache Software Foundation — and other open source, distributed computing software such as Pig, the parallel programming language developed by Yahoo! Research. Researchers at HP Labs, the central research arm of HP, will use the test bed to conduct advanced research in the areas of intelligent infrastructure and dynamic cloud services. HP Labs recently sharpened its focus to help HP and its customers capitalize on the industry’s shift toward cloud computing, a driving force behind HP’s vision of Everything as a Service. With Everything as a Service, devices and services will interact seamlessly through the cloud, and businesses and individuals will use services that anticipate their needs based on location, preferences, calendar and communities. Intel is a leading provider of platform technologies, including processors, chipsets, networking and SSD (solid state drives), for cloud computing data centers. Current platform features such as Data Center Management Interface (DCMI), Node Manager (NM) and virtualization have been designed to improve the manageability and energy efficiency of data centers. This open, collaborative research effort will give researchers full access to the system’s hardware for further innovation of existing and future platform features. IDA will facilitate research in the test bed by providing its users with the computing resources required to develop cloud computing software and applications. IDA will also leverage the test bed and its industry partnerships to train local students and professionals on the technologies and programs associated with cloud computing. The Cloud Computing Test Bed is the next step in expanding each company’s ongoing initiatives in cloud computing. In November 2007, Yahoo! announced the deployment of a supercomputing-class data center, called M45, for cloud computing research; Carnegie Mellon University was the first institution to take advantage of this supercomputer. Yahoo! also announced this year an agreement with Computational Research Laboratories (CRL) to jointly support cloud computing research and make one of the 10 fastest supercomputers in the world available to academic institutions in India. Earlier this year, Yahoo! hosted the first-ever Hadoop Summit and Data-Intensive Computing Symposium. Co-sponsored with the Computing Community Consortium (CCC), these meetings brought together leading experts from industry, academia and government to discuss the future directions of Hadoop and data-intensive computing. In 2008, HP announced the formation of its Scalable Computing & Infrastructure Organization (SCI), which includes a dedicated set of resources that provide expertise and spearhead development efforts to build scalable solutions designed for high-performance and cloud computing customers. The company introduced scalable computing offerings including the Intel Xeon-based HP ProLiant BL2x220c G5, the world’s first server blade to combine two independent servers in a single blade, and the HP StorageWorks 9100 Extreme Data Storage System (ExDS9100), a highly scalable storage system designed to simplify the management of multiple petabytes. (1) HP also introduced the HP POD (Performance-Optimized Datacenter) (http://www.hp.com/products/pod), an open architecture, compact, shipped-to-order alternative for deploying IT resources. Organizations interested in learning more about research in cloud computing and other key industry issues are invited to contact HP, Intel or Yahoo! at http://www.hpl.hp.com/, www.intel.com/research and http://research.yahoo.com/cloud. Intel (NASDAQ:INTC), the world leader in silicon innovation, develops technologies, products and initiatives to continually advance how people work and live. Additional information about Intel is available at www.intel.com/pressroom and blogs.intel.com. Yahoo! Inc. is a leading global Internet brand and one of the most trafficked Internet destinations worldwide. Yahoo! is focused on powering its communities of users, advertisers, publishers, and developers by creating indispensable experiences built on trust. Yahoo! 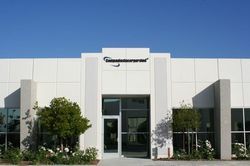 is headquartered in Sunnyvale, California. For more information, visit pressroom.yahoo.com or the company’s blog, Yodel Anecdotal. HP focuses on simplifying technology experiences for all of its customers — from individual consumers to the largest businesses. With a portfolio that spans printing, personal computing, software, services and IT infrastructure, HP is among the world’s largest IT companies, with revenue totaling $110.4 billion for the four fiscal quarters ended April 30, 2008. More information about HP is available at http://www.hp.com/. (1) 1 petabyte equals 1,000 terabytes or 1,0005 bytes. Yahoo! and the Yahoo! logos are trademarks and/or registered trademarks of Yahoo! Inc. This news release also contains forward-looking statements that involve risks, uncertainties and assumptions concerning Yahoo!’s expected performance (including without limitation the plans for the Global Cloud Computing Research Test Bed and the statements from management in this news release), as well as Yahoo!’s strategic and operational plans. Actual results may differ materially from the results predicted. The potential risks and uncertainties include, among others, the possibility that the expected or planned activities of the collaboration described might be delayed, might not ultimately be implemented, or if implemented might not be successful; and that the anticipated benefits to Yahoo!, Infocomm Development Authority of Singapore (IDA), the University of Illinois at Urbana-Champaign, the National Science Foundation (NSF), the Karlsruhe Institute of Technology (KIT) and the collaboration’s other members might not be realized; the potential for litigation costs and adverse results in litigation, including intellectual property infringement claims; the collaboration might fail to protect its intellectual property and the value of its brands diligently; Yahoo! depends and the collaboration might depend on key personnel; the collaboration might depend on third parties for technology and funding; general adverse economic conditions and changes in economic conditions might impede the collaboration’s efforts; potential continuing uncertainty arising in connection with Microsoft’s various proposals to acquire all or a part of Yahoo! ; the possibility that Microsoft or another person may in the future make other proposals, or take other actions which may create uncertainty for Yahoo’s employees, publishers, advertisers, and other business partners, which might affect the collaboration; and the possibility of significant costs of defense, indemnification, and liability resulting from stockholder litigation against Yahoo and its directors and officers relating to such proposals might affect Yahoo’s funding of the collaboration. Yahoo! does not intend, and undertakes no duty, to update this information to reflect future events or circumstances. More information about potential factors that could affect Yahoo!’s business and financial results is included under the captions “Risk Factors” and “Management’s Discussion and Analysis of Financial Condition and Results of Operations” in Yahoo!’s Annual Report on Form 10-K for the year ended December 31, 2007, as amended, and the Quarterly Report on Form 10-Q for the quarter ended March 31, 2008, which are on file with the SEC and available at the SEC’s website at www.sec.gov. Additional information will also be set forth in those sections in Yahoo!’s Quarterly Report on Form 10-Q for the quarter ended June 30, 2008, which will be filed with the SEC in the third quarter of 2008. ROUND ROCK, Texas (Business Wire EON/PRWEB ) July 29, 2008 — Dell’s smallest, most personalized and most environmentally responsible consumer PC, the Studio Hybrid, launches today. Available immediately at www.dell.com/hybrid, the PC’s new unique shape and size, personalized with six optional, external jewel-toned color or bamboo sleeves, unleashes stylistic expression, inspiration and fun and looks great in any room. Dell also unveiled two new Inspiron PCs, including the Inspiron 13, a sleek and stylish sub-$800 13-inch laptop perfect for students heading back to school, available starting next week at Wal-Mart. The Inspiron 518 desktop, available immediately at www.dell.com, is designed for everyday family multi-media activities, be it catching up on favorite TV shows via the Internet, playing online games, and storing and accessing music playlists and digital images. As with Dell’s recently announced Studio laptops, the Studio Hybrid was designed to enhance personal expression and creative living. Dell’s smallest desktop PC, about the size of a collegiate dictionary, can fit just about anywhere. Depending on the location or decor, the Studio Hybrid can be set up in a vertical or horizontal orientation, and be personalized with a choice of seven optional, interchangeable external finishes or color sleeves: Bamboo, Emerald, Quartz, Ruby, Sapphire, Slate, and Topaz. Wi-Fi networking – allows people to place the PC anywhere that’s convenient for them. Wireless keyboard and mouse help ensure a clean desktop, counter top or coffee table. Blu-ray Disc™ drive for watching high-definition DVDs. Reduced packing materials about 30 percent by weight as compared to typical tower desktops. Packing materials are also 95 percent recyclable. Reduced printed documentation 75 percent by weight on average as compared to typical tower desktops. System recycling kit is included. Dell also expanded its Inspiron family with the addition of the Inspiron 518 desktop and Inspiron 13 laptop. 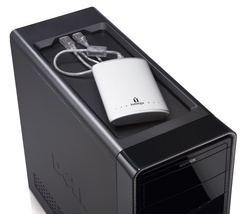 Both systems deliver solid performance and smart style at a great value. The Inspiron 13 laptop is a great choice for back to school shoppers looking for a small, light, highly efficient mobile PC. With a starting weight of just under 5 pounds, the Inspiron 13 combines a simple and clean design encased in glossy Pacific blue with black trim. Smart features include a 13-inch high definition display, capacitive touch media buttons, 8-in-1 media card reader and slot-load DVD drive. Optional features include built-in wireless networking, built-in webcam and Bluetooth connectivity. A special $699 configuration of the Inspiron 13 will be available at Wal-Mart in the U.S. starting Aug. 3. Fully configurable systems will be available on www.dell.com on a global basis later in the month. The Inspiron 518 desktop features a gloss-black exterior with chrome accents. Families will appreciate the top media tray with two easy-access USB ports for quick MP3 player syncing and cell-phone charging. It offers performance to meet the most typical family PC activities, like fast networking connections with Gigabit Ethernet, DX10 integrated graphics2 for casual gaming, optional 500GB3 hard drive for storing digital images and music libraries, and optional quad core processors. The Inspiron 518 starts at $349, (monitor not included) and is available immediately on www.dell.com. Dell Support Center: Centrally located, easy-to-use application providing personalized support resources with quick links to service, support and system information resources www.dell.com/dellsupportcenter. PC TuneUp: An easy-to-set-up smart tool that helps manage regular maintenance of a consumer’s PC. Designed to automatically find and fix issues that slow down system performance. Available for $39.95 at www.dell.com/pctuneup. Dell Dock: Automatically sorts pre-installed software into user friendly categories placing the most frequently used programs front & center. Dell Video Chat: A one-click easy to setup and use video and voice communication program that can be shared with friends and family, www.sightspeed.com/dellvideochat. Dell Inc. (NASDAQ: DELL) listens to customers and delivers innovative technology and services they trust and value. Uniquely enabled by its direct business model, Dell is a leading global systems and services company and No. 34 on the Fortune 500. For more information, visit www.dell.com, or to communicate directly with Dell via a variety of online channels, go to www.dell.com/conversations. To get Dell news direct, visit www.dell.com/RSS. Offers subject to change, not combinable with all other offers. Taxes, shipping, handling and other fees apply. U.S. Dell Home and Home Office new purchases only. Dell reserves right to cancel orders arising from pricing or other errors. 1 Windows Media Center is available in Windows Vista Home Premium and Windows Vista Ultimate. TV playback and recording features require a compatible PC TV Tuner. 2 Significant system memory may be used to support graphics, depending on system memory size and other factors. 3 GB means 1 billion bytes and TB equals 1 trillion bytes; actual capacity varies with preloaded material and operating environment and will be less. Web conferencing comparison portal presents an updated classification of 21 online meeting tools. Frankfurt, Germany (PRWEB) July 29, 2008 — www.webconferencing-test.com, the vendor-independent comparison portal for web conferencing services, now offers updated test results for 21 different solutions for collaboration over the Internet. The new software review shows that Microsoft Office Live Meeting 2007 has made substantial progress on the existing test winners from WebEx and Citrix. The new test results at webconferencing-test.com now also offer the "other web conference tools > more test results" category in addition to a comprehensive comparison of the five best solutions. This includes summary information and assessments on the tools tested and the consolidated results for each test category. The following solutions were newly included in the test group in order to cover the full range of the still growing market for online meeting solutions: WebHuddle, IBM Sametime Unyte Meeting, IBM Sametime Unyte Share, DigitalMeeting, we:presenter, iVocalize, pcvisit 4 Business Meetings, Bridgit Conferencing and RHUB. Various license models are offered for web conferencing solutions. In the new "license models" category webconferencing-test.com presents the various approaches and gives advice on which license models are suitable for which usage types and intensities. The comparison portal differentiates now even more clearly between tools for freelancers, small and medium-sized companies on the one hand and those for large companies on the other. The aim is to allow SMEs in particular a quick orientation to the ever growing range of solutions in the marketplace. (TheForceField.Net ) July 28, 2008 — Weeks after the DNS bug was announced publicly and a patch was officially made available, many ISPs have yet to patch their servers. Among those deemed by the industry as slow to respond include AT&T, Earthlink and Time Warner. The flaw, discovered by security researcher Dan Kaminsky, is considered a serious and dangerous one. It was given immediate attention and a patch was quickly developed and released by a rare consortium of software companies. Shortly afterward the first code that exploits the bug was released and is now in the hands of hackers. Yet, for all the concern and risk involved in leaving their servers vulnerable to attack , many ISPs are taking their time to employ the fix. Why? According to Earthlink, they are working to complete the patch for their server farms now. Jesus Lopez, Senior Manager of Core Services Engineering told the Force Field that they already patched the first of two server farms and are in the process of patching the second. "We are on schedule to complete our patching by 7/31", Lopez said. Officials at Time Warner could not be reached for comment. The DNS flaw allows hackers to launch undetectable attacks on users of ISPs that have not patched their servers. The code can also be used to redirect Internet users to phony software update servers to download and install malware. Security experts are warning everyone to patch immediately. To check the vulnerability of your ISP or DNS server go to Dan Kaminsky's blog at http://www.doxpara.com . If your ISP has not patched or is vulnerable you can use OpenDNS . (TheForceField.Net ) July 24,2008 — DNS attack code that exploits the DNS vulnerability found and patched earlier this month was released yesterday on Metasploit. The code was released by the developers of the Metasploit hacking toolkit. The bug was discovered by Dan Kaminsky of IOActive, Inc. and announced to the public earlier this month after a patch was created with the rare co-operation of major software vendors. The code allows hackers to launch undetectable attacks on users of ISPs that have not patched their servers. The code can also be used to redirect Internet users to phony software update servers to download and install malware. Security experts are warning everyone to patch immediately. To check the vulnerability of your ISP or DNS server go to http://www.doxpara.com .If your ISP has not patched or is vulnerable you can use OpenDNS . This email/productivity software works in the off-line mode and also has available options for word processing, spreadsheets, task management, and more. The desktop runs as a stand-alone application and uses JAVA to store data locally. Google has been working on something similar, built on the open source “Gears” project, but has yet to release anything. The Zimbra Desktop does not run in a browser, it's more like Outlook. A nice feature is that it functions so much like Outlook that even the keyboard shortcuts you're used to using with Outlook will work within the Zimbra application. A few “gotchas” remain though, most notably that it doesn't sync with your contacts/calendar (you have to do a manual export/import) and the IMAP folder sync seems to be a bit funky. All in all, it's not a bad first attempt. Take a look at it if you're contemplating an alternative to Outlook. Just keep your fingers crossed that a Microsoft Yahoo buyout doesn't happen; the Zimbra suite is a major competitor to Exchange and we know what would happen to Zimbra if a deal goes through.